Sanibel, FL—When you’re based in a state that’s surrounded by water on three sides, water quality is very important to you. Lily & Co. Jewelers on November 10 hosted a successful charity tennis event called Raise A Racket For Clean Water, at the Beachview Tennis Club in Sanibel. Image, from left: Lily & Co. Jewelers co-owner Dan Schuyler, coach Nick Bollettieri, Doves' chief designer Doron Paloma, and Lily & Co. co-wwner Karen Bell. 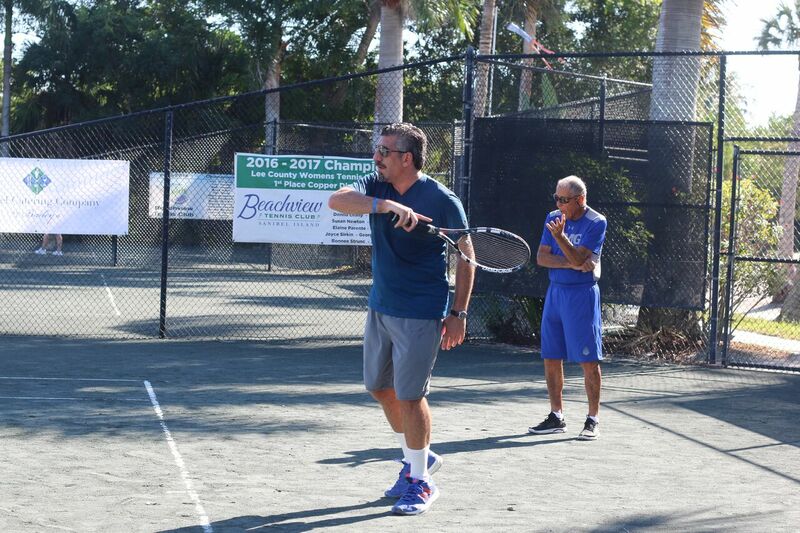 The jeweler partnered with International Tennis Hall of Fame coach Nick Bollettieri and his IMG Academy team, to present the tennis event in support of clean water efforts through the Sanibel Captiva Conservation Foundation. 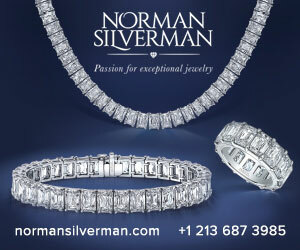 Doron Paloma, chief designer of the jewelry brand Doves, was visiting the jeweler for the event. Not only did he play in the tournament, he won first place! Doves' chief designer Doron Paloma gets instruction from famed tennis coach Nick Bollettieri. Trophies donated by Lily & Co. were presented to all finalists of the Doubles Round Robin play. Sanibel Catering Company provided a courtside breakfast and lunch, and attendees also had the chance to win one of several raffle prizes from Lily & Co., Sanibel Catering, Beachview, IMG Academy, and other donors. The day was made possible by sponsors Skip Leonard, Lee Memorial Health Systems; Sanibel Catering Company by Bailey’s; Dr. Marius Espeleta Pediatric Medicine; Rich Vernsey, Wrigley’s Tennis; Duane Chaney, Arch Capital Advisory Group; Bob Walsh, R.S. Walsh Landscaping and The Island Sun and staff. 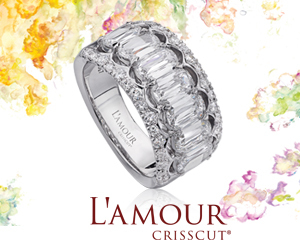 Beaumont, TX—No need to get up at 3 a.m. to go shopping at Alter’s Gem Jewelry on Black Friday. Instead, the jeweler is throwing its annual holiday party on Wednesday, November 21—just in time for customers and friends to take a break from turkey preparation, and sleep in on Friday! 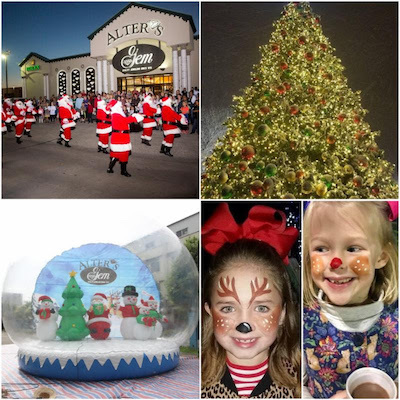 Alter’s will light its famed 36-foot Christmas Tree for the fifth year in a row, and celebrate with a party for the whole family, featuring a dance performance, face painting and a bounce house for kids, hot chocolate and popcorn and, of course, the big red guy himself, Santa Claus. All that before Santa has to fly off to New York City to take his place in the famous Macy’s Thanksgiving Day Parade—which many Americans consider to be the “official” start to the holiday season. New York, NY—Assael has won the CPAA 2018 Spotlight Award for its “Flex” bangle in 18k gold, designed by Sean Gilson for Assael. This award—a new category specifically focused on pieces where 75% of the design features one particular type of pearl—marks consecutive wins for Assael. This year’s Spotlight Award is focused on the Akoya pearl, a central element in Gilson’s design. 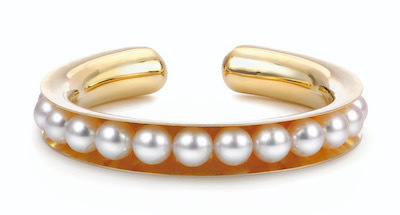 This year’s winning bracelet uses Gilson’s expertise in making gold flexible through the technique of anticlastic raising, where gold is hammered in one direction and then in reverse, making it flexible and making curl back on itself. This hand-fabricated technique was used centuries ago by the Celts, and is once again being used in modern times—first made famous by designer Michael Good—but it was not used for centuries in between. Flex cuff by Sean Gilson for Assael.